I have a wonderful GIVEAWAY for you today. It’s no secret I have a love for transferware so you can imagine my excitement when I recently won a gift certificate to Nancy’s Daily Dish. Now, Nancy is generously offering one of my readers the opportunity to win up to $50 gift certificate to her new on-line shop. 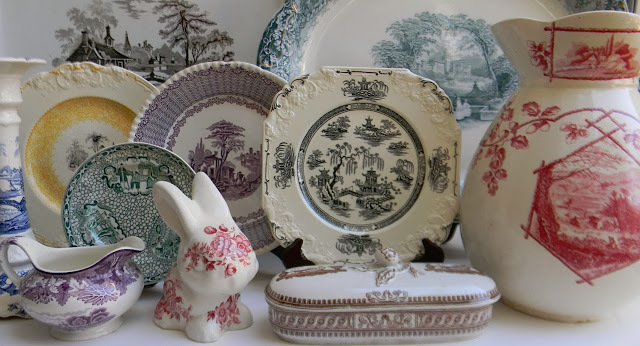 Nancy has one of the largest collections of 19th and 20th Century English transferware on the web and currently has over 900 pieces in the shop. There are new pieces added every day and plenty of beautiful things to choose from. Leave a comment here on what you would choose with the $50 from Nancy’s Daily Dish shop, along with the link to the item. If you would like additional entries…..
For a 2nd entry: “Like” Nancy’s Daily Dish on Facebook HERE and then come back here and leave an additional comment . Please make sure you leave an email (or blog) where you can be reached should your name be selected. The giveaway ends on 1/5/14 and a winner will be chosen from all eligible entries. Nancy is also offering a 15% discount on purchases in Nancy’s Daily Dish through 1/15/14. Just use the code NoMinimalist to get the discount. Thanks for entering and best of luck to everyone! I've ordered many things from Nancy – love her stuff! How generous of her to offer a giveaway. I'd love some more brown transferware (or many red or purple?) too many to choose from! I would love to add the RED POLYCHROME TRANSFERWARE PLATE ROSES CHINTZ WITH PERIWINKLE FLOWERS to my collection. I have a couple of pieces of these gorgeous plates. Thanks so much for the giveaway! Sherry, I discovered your blog a few months ago and have been enjoying reading back through your older posts as well as your new. I am thrilled to have found Nancy’s Daily Dish through your blog! My love of transferware dates back decades to when I tagged along on antiquing forays with my parents. My inherited odds and ends are lovingly displayed all through my home. Finding just one item on Nancy’s Daily Dish to choose will take quite a bit of time and deliberation as I can’t decide on any one pattern or color! I hope not linking to one item won’t disqualify me. Now to return to NDD and try to narrow it down! Please enter my name in the give away!!! There are so many yummies to choose from and too numerous to link back to!!! What a fabulous giveaway! I would love the blue transferware nesting hen pitcher. I have Liked Nancy's Daily Dish on Facebook! And, I've already liked Nancy on Facebook! Thanks for the chance to win! Happu Holidays! I have a running list of things we need/would like for our kitchen and entertaining purposes. I love the sugar bowl and it became abundantly cream we need a gravy boat so I have two I love. Hi Sherry- how awesome, what a neato giveaway! Thanks! I wish I did FB but don't yet, but I hope you both please consider this a sincere entry! I love all kinds of transferware and decorate with it all over the house. But I have wanted a pair of hands dish like this one in Blue Calico Chintz http://nancysdailydish.net/collections/all?page=10 to use in the Master bathroom near the Garden tub to hold pretty soaps. What a lovely and generous thing to do for your readers/followers! I love the "Aesthetic Movement China Black Transferware Plate Trailing Vines Spider Mum Chrysanthemum Staffordshire England" for its graceful foliage and lyrical design. Keep posting – I love your blog! Nancy has such lovely things, but I think I would choose something that is yellow transferware since my walls are in a cheery yellow. Nancy has such lovely transferware and I love it all, but the yellow would be my choice since my walls are a happy yellow. I liked Nancy on Facebook. I love ALL of the blue transferware but would like to start a collection of cups and saucers, so that is what I would choose. GREAT giveaway!!! Thanks!!!!!!!! Oh, clicked on the cup and saucer but it didn't go to another link???? So many to choice from, I especially like theVintage Spode Yellow Transferware Urn Roses Italian Garden Scenry plates. Just beautiful. Thank you! I would love Rural Scenes http://nancysdailydish.net/search?page=3&q=rural+scenes $76.00! Thank you for this great giveaway! Wonderful giveaway! I'd love the Red-Pink Transferware platter! I've ordered from Nancy before and love transferware. I would love to add this Spode plate to my collection. I liked her on facebook. Thanks again. Shared to facebook and heading to add to sidebar on blog. Thanks again. I've never seen this combination and I think it's lovely! I have enjoyed all of the things I have ordered from Nancy! I have a special plate with a beautiful white cow on it. Those bucolic white cows with the black ears on English transferware are Ancient British Whites. I raise them and they are as sweet as puppies. So I would choose a classic pattern with those sweethearts as the center. Thanks for your generosity, Nancy! I would choose a purple transfer ware selection. To me it is very beautiful and unique! Having ordered from Nancy before, I'm very familiar with her beautiful pieces…so many to choose from and almost impossible to pick, but I would have to choose the English Transferware Large Brown Platter, http://nancysdailydish.net/collections/brown-transferware/products/english-transferware-large-vintage-brown-polychrome-platter-castle-stream-roses-vintage-china-home-decor. It will look beautiful over our sofa with my grouping of botantical prints and woodland scene. Thank you Nancy for this wonderful giveaway! I love the Two Color Transferware Plate in red and black by Spode! However, I think it would be had to find anything that I don't love in Nancy's shop. I would love this beautiful black transferware! Thanks for the giveaway, Nancy. Nancy, before I saw your blog I would not have thought of all the wonderful possibilities of decorating with transferware! Thank you, & Happy New Year! This is a fabulous giveaway Sherry! Thanks for the chance. I would get purple transferware. I have liked Nancy's Facebook page. Thanks again Sherry and Happy New Year! oh my goodness the china rooster pitcher is gorgeous, that would be my pick! thanks for sharing the giveaway. I would pick any two blue and white plates for my pick or maybe a pitcher for flowers. So many wonderful choices. I would love to add to my small collection of pink Copeland Spode transferware. Thanks for the opportunity to win this giveaway. I have a lot of green transferware, but now I am starting to collect a bit of yellow. I would like this yellow transferware plate. Love the very pretty square shape and colors! Although, there are so many beauties at Nancy's Daily Dish! I'd be happy with almost any piece from her gorgeous collection. I love, love, love these lazy susan dishes with the covered tureen in the middle. I have purchased several of Nancy's things in the past, but I have somehow missed these. Happy New Year to you and thanks for doing this! This Spode platter makes my heart go pitty-pat! I love Nancy's Facebook page! Liked it too! I would like to have the Wine Cask. Red & Black & White piece. And of course, I already Like Nancy on FB! I would love that brown transferware brown turkey platter. She has a beautiful website. Love tranferware…I'd chose the black English transferware soup bowl and plate. I have some pieces from her and I love them. I can't wait to get in my new house and buy some more pieces. Thanks for the chance!! I love yellow and white ironstone, so I'd start with http://nancysdailydish.net/products/vintage-english-ironstone-bowls-yellow-and-white-scrolls-and-vines-on-white-ironstone. There are also plates, a gravy boat, cups, and a tureen with that same yellow transfer! I love Nancy's Daily Dish and have shopped from her before. I would love to put the $50 toward VINTAGE ENGLISH PINK RED TRANSFERWARE MASONS VISTA SQUARE HANDLED TEAPOT TEA KETTLE. Thank you for this great give a way. http://nancysdailydish.net/collections/brown-transferware/products/vintage-tulips-roses-and-daisies-brown-transferware-teapot-tea-pot-coffee-pot I love this pot! Sherry, what a fabulous giveaway! I love any of the black and white transfer ware! She has an amazing selection! Thank you for hosting! Posted on my Facebook page – now have fingers crossed for a big win. The 15% offer is also a big win! So thrilled to see transferware in the design mainstream–mostly due to Nancy!! Love the turkey platters and I am enchanted by the many shades of green. That is the one I would choose! Not sure what happened, but I posted earlier today and I don't see it so here we go again…love everything Nancy has but especially love the blue transfer ware as I've just started collecting….I think i would choose the blue platter…gathering hay or. Plate and the soap dish.. Liked on Facebook… Thanks for a great give away.. I love this – simply gorgeous! I would do an instant wall display. They are very nice. Thanks. There is not a single dish that I would not be happy and proud to own of Nancy's. Every piece that is offered is a treasure! What fun and thank you everyone! I love, love, love this red transfer ware platter! I now like Nancy's Daily Dish on Facebook. I adore this salt & pepper. That's what I would buy if I won. RED TRANSFERWARE FISHING SCENE AT WINDSOR CASTLE W/ VICTORIAN SCROLLS AND ROSES DEEP PLATE SOUP BOWL WEDGWOOD. I love the Dark Flow Blue ish Black ishTransfer Ware Pitcher Sparrow Bird Daisy Butterfly Daisies Staffordshire England! Beautiful! Sherry, Nancy is one of my favorite bloggers, and I've bought several pieces from her. She is a dear person and of course has beautiful things. I "liked" her on Facebook. Thanks for a chance to win. This is a great give away! It would be fabulous to have thevintage english purple wall display. It reminds me of my late Dear grandma. Gorgeous new site. No more Etsy? It's just lovely and I enjoyed browsing. So many delicious pieces. I think if I won I would pick the sage/olive green transferware cream and sugar set on page 7. I have this J&G Meakin Renaissance set. I am missing many of the extra serving pieces though. I just recently found the coffee pot too! So that would be perfect! Thanks for the chance to win! Great giveaway! I am a fan on Facebook and I am going to tweet this giveaway on Twitter now 🙂 Thanks! What a great giveaway!!! I would put it toward "MIX N MATCH VINTAGE ENGLISH CHINA RED TRANSFERWARE PLATES INSTANT WALL DISPLAY OR COLLECTION" http://nancysdailydish.net/collections/red-transferware/products/9-mix-n-match-vintage-english-china-red-transferware-plates-instant-wall-display-or-collection. Stop me someone 🙂 as I said I love it all. Thanks for this giveaway girls! I would be ecstatic if I won and would order a brown transferware platter! I would probably choose something to add to my blue collection as the platter or the serving bowl. But love everything and hard to choose! Thank you for the chance! Thank you and Nancy for this wonderful give-away!! Fingers crossed here. Thanks to both Nancy and you for this fabulous giveaway. I can only hope. I have loved the pink and blue transferware for years, and have pieces of both, but I think I would love some yellow transferware for Fall!